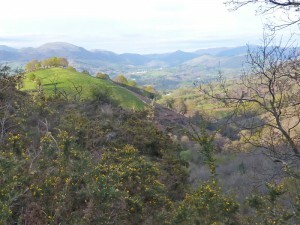 « Spring in the Basque Country (1): ¿Madera? No, leña. I have joined a walking club. 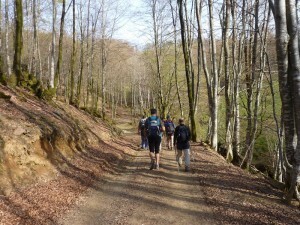 The first walk is 22km with 1200m of climbing in total. I estimate 7–8 hours. I don’t need lunch, I am told, but I don’t agree, so I take one anyway. We set out at 8:15 from Lekaroz. It is soon hard to keep up. After half an hour, I am getting hot, but nobody understands, so I take off my anorak and shirt and stuff them in my rucksack while walking. I am equipped for a hot day, a cold day, a rainy day. Everybody else has a metaphorical pocket handkerchief dangling from the end of a stick. In any case, if it rains, the droplets will be blown away in our slipstream without wetting us. After an hour I am thirsty so I fish my bottle out of my rucksack and drink while walking. After four hours we stop to gobble down a maximum of food in a minimum of time. The high point of the day is when we reach the summit of the Unboto (800m) and stop for three minutes. We arrive back at Lekaroz, after five and a half hours of intense walking. The views, it has to be said, were stupendous. 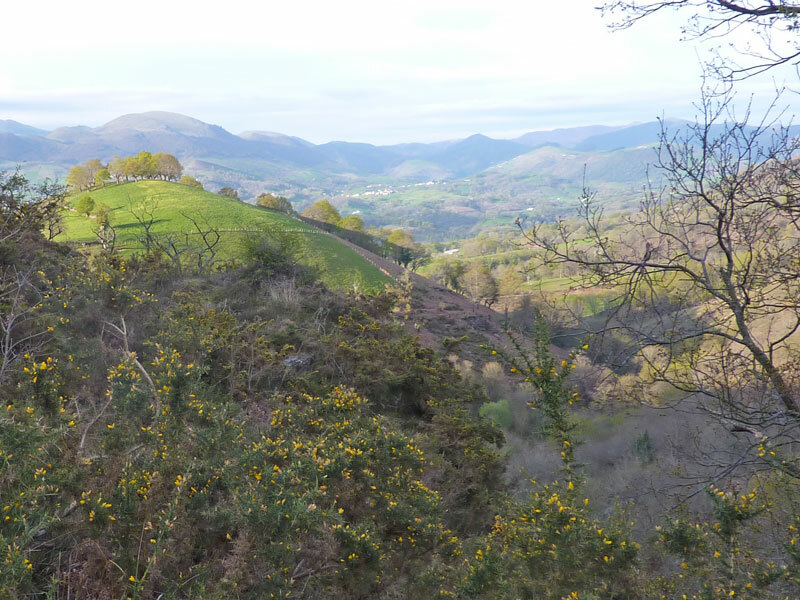 Rollicking green hills with distant pinnacles behind. We saw corzos (roe deer), three – too far away to photograph. Someone pointed to a grove of what looked like silver birch (abedul) and said “tejos” (yew trees). (Didn’t understand.) Then we stumbled upon the precioso (wonderful) restaurant of Etxebertzeko borda in the middle of nowhere. Naturally it was closed: restaurants here open from 13:30 to 15:30. Suddenly, I understood why I didn’t need to bring lunch. And why we were rushing. We had to get home in time to eat. But even here I was mistaken. 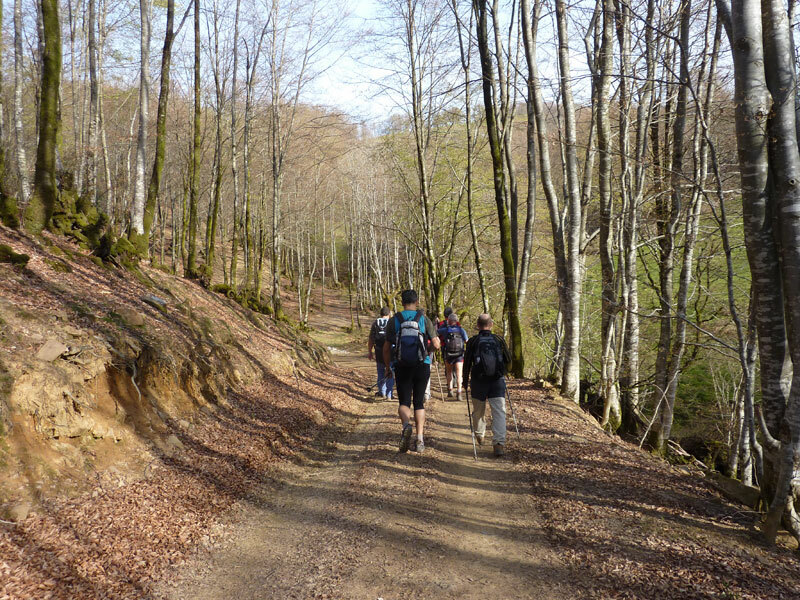 At the end Pascual explained “Normally we do stop more often but we are organising a competition at the end of May, and we wanted to see how long it would take the fastest walkers.” Undoubtedly somebody had explained this to me; I simply hadn’t understood. This entry was posted on Sunday, April 18th, 2010 at 2:36 pm	and is filed under Uncategorized. You can follow any responses to this entry through the RSS 2.0 feed. You can leave a comment below, or trackback from your own site.